A few days ago I posted Erika and two of the grandkids walking in the apple orchard. Then Steve’s art on the mantel with the Granny Smith apple. Just for fun I did a google search – Apple and rutheh. Quite a few photos of apples or some form of apples appeared in the results. Many apple photos over the years of blogging. Some other fruit appeared and even some tomatoes as I scrolled down. Here are a few examples of apple photos from previous posts. There is the Before they Get to the Store post showing how Honey Crisps are grown in Washington. 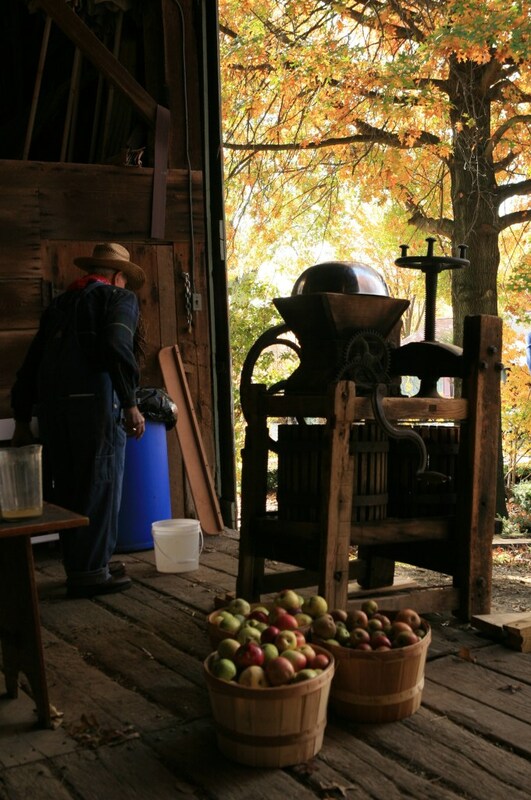 Cider making in North Carolina in the first photo and a Cider Press in Pennsylvania in second. 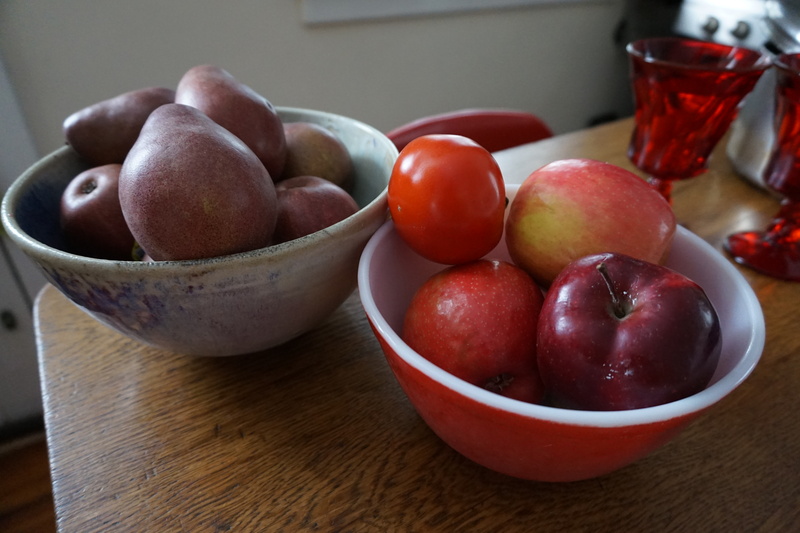 Three photos-variations on Fruit- pastries, a bowlful and a single red apple. Mark brought a pastry box filled with “fruits” from Mozart’s Austrian Cafe down on High Street in Columbus. The peach had marzipan inside. I checked out their menu and plan to get a piece of apple strudel before I return to Pittsburgh. Their dessert descriptions are enticing. You can eat in their restaurant, too. Piano bar. 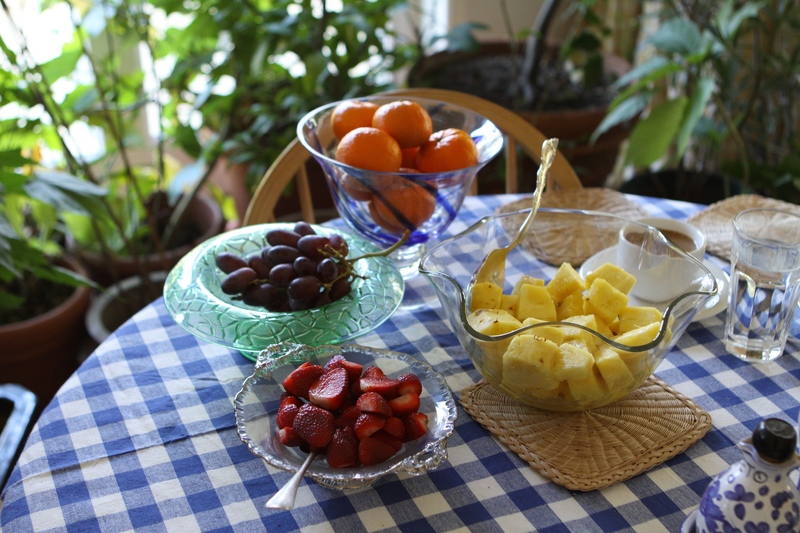 And at Mark and Erika’s home, on the same kitchen counter as the pastries sat a large wooden bowl filled with fresh fruit. I chose one to wash and cut up into slices. Patriotic fruit. In Fiestaware. Joanne (in FL) made this for breakfast along with an eggy casserole. from the archives Invitation. Waiting to be selected, a thumb poked into the center, then peeled with ease. Each section eaten separately. 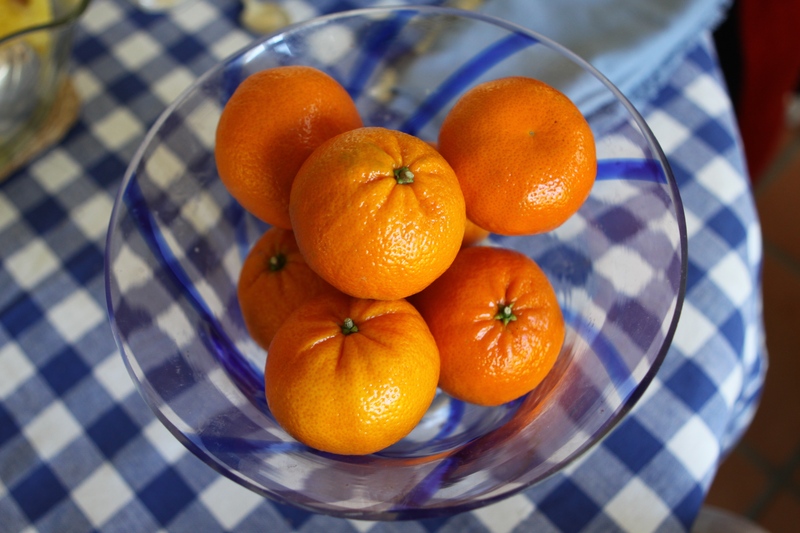 Morning citrus. Seedless. One of the most useful dishes. Fill a bowl with food. 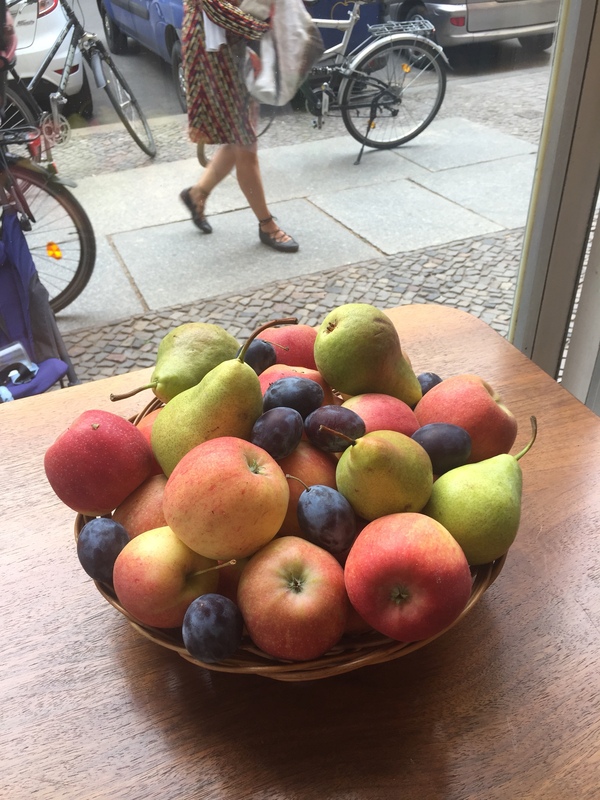 Or in this case, fruit. and fill it with something good. 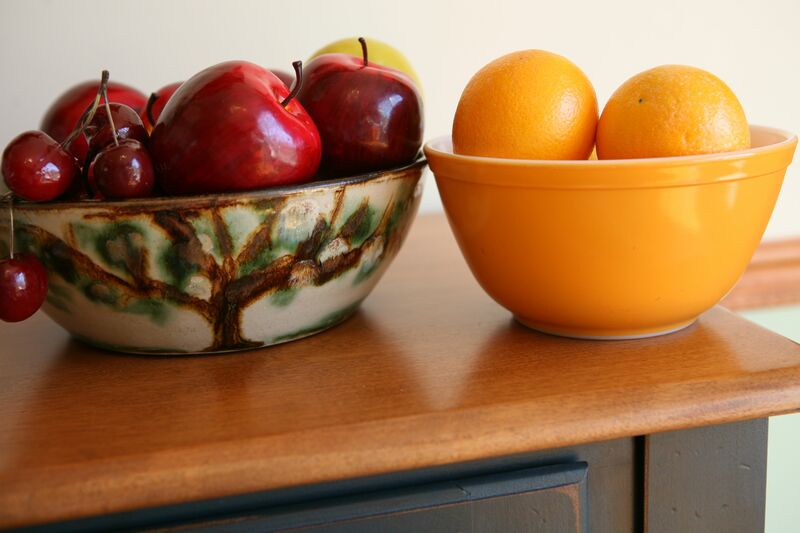 Fruit bowl still-life, close up.. Waiting for just the right moment. Going to be mixed with fresh strawberries and served on Orange Granita. Placed on a wide window sill.